In the four days after the Newton shootings, Sturm Ruger’s shares fell 15 per cent to a six-month low. 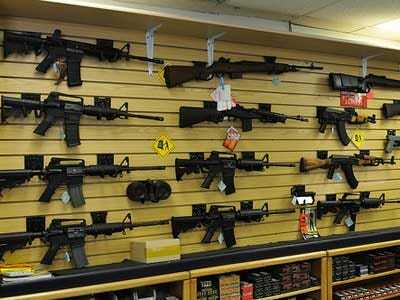 The stock has recovered those losses and closed on Feb. 22 at $53.67, up more than 12 per cent since Obama laid out gun control plans on Jan. 16. Smith & Wesson’s shares fell more than 18 per cent after Newtown, but now trade nearly 20 per cent above the four-month low they hit in December. They closed at $9.18 on Feb. 22. The ad says [a Department of Justice memo] shows that the administration “believes that a gun ban will not work without mandatory gun confiscation” and thinks universal background checks “won’t work without requiring national gun registration” — ideas the president has not proposed or expressed support for. But there’s even more good news for the industry beyond gun manufacturers. Ammo has been flying off the shelves so fast that people are taking to Twitter to complain about it, and even some gun shops are reporting guns being sold out. Wall Street analysts expect Smith & Wesson to report revenue of $133.7 million, a 36 per cent rise over the same period a year ago. The forecast for Sturm Ruger’s is projected to grow 30 per cent to $121.5 million.